At The Manhattan Center for Headache & Neurology, helping the patient is priority. Treatment consists of multiple providers collaborating to ensure the patient receives a variety of options for treatment. The Manhattan Center for Headache & Neurology believes that treating patients starts with providing the best specialists. Our medical professionals include doctors, nurse practitioners, technicians and massage therapists. In addition, we offer in house testing like EEG, EMG, and VNG to determine and rule out causes for conditions. The center follows Dr. Halpern’s multifaceted approach to treating headache and all other neurological conditions. 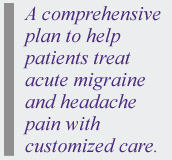 Our patient will receive care from our professionals as treatment depends on the collaborative approach at The Manhattan Center for Headache & Neurology. We invite you to book an appointment. We look forward to meeting you! The Manhattan Center for Headache & Neurology recognizes that our patients are very busy and need to see a doctor around their schedules. That is why we offer early morning and evening availability! Often, because of the frequency of headaches and the need for frequent visits, convenience is of the utmost importance, second only to receiving the best and most compassionate care. For this reason, Dr. Halpern and The Manhattan Center for Headache & Neurology makes every attempt to provide convenient hours and on-time visits in the office. Offering immediate access for questions, concerns, or appointments is an important part of this convenient care. Many neurological conditions, such as migraine and concussion, can be treated through a multi-faceted approach. Benefit may be both seen and felt when paying needed attention to all aspects of how a neurological condition may be affected by life circumstances and how life circumstances are affected by neurological conditions. As a board certified neurologist, Dr. Halpern will also diagnose and treat a wide variety of neurological disorders or conditions, including concussion, head injury, back pain, neck pain, pinched nerves, neuropathy, seizures, stroke, multiple sclerosis, Parkinson’s disease, and others. At The Manhattan Center for Headache & Neurology, Dr. Halpern and all collaborating nurse practitioners are specialized to treat these conditions with a unique specialized approach centered on each individual patient. All of these techniques can be integrated into a comprehensive plan to help patients effectively manage and minimize frequency and severity of headaches and other neurological conditions through a customized treatment plan based on each patient’s lifestyle, triggers, history, and symptoms. Dr. Halpern and The Manhattan Center for Headache & Neurology currently accepts United, Oxford, BCBS, Aetna and Cigna. In addition, many insurance policies provide out-of-network benefits, allowing the patient to submit a bill for reimbursement. A medical bill will be provided for reimbursement through your out-of-network benefits upon request. Some additional services may not be covered by insurance such as house calls or alternative treatments. If you have insurance, either individually or through a small business employer, that is purchased on NY State’s Health Insurance Exchange, Dr. Halpern IS NOT in network with any exchange products EXCEPT for Pathways and Pathways Enhanced. Concierge-style medical practitioners like Dr. Halpern and all practitioners at The Manhattan Center for Headache & Neurology have fewer patients, thus are more available to see and treat you. For this reason, Dr. Halpern and The Manhattan Center for Headache & Neurology does not overbook patients and requests a minimum of 24 hours of notice for cancellations. To set up a consultation call 646-559-4659 or e-mail Dr. Halpern at drhalpern@audreyhalpernmd.com. Scroll down to find the street address along with a link for a map and directions. Exciting Changes In Our Practice! We are happy to announce the exciting changes that are occurring within our practice. Due to the growth of The Manhattan Center For Headache & Neurology and the increased patient volume, we have added two new providers: Yoni Dokko, MD (Neurologist) and Yasminda D. Muse, NP.. Audrey Halpern, MD along with with her clinical staff will treat patients using Dr. Halpern’s approach to concierge style of medicine. Dr. Halpern has personally trained her clinical staff to model her treatments. The clinical staff is exceptionally talented in treating neurology and headache conditions. Each patient will continue to receive the individualized care that has been given in the past. Every patient will be seen by any one of our center’s providers and the appointment scheduled will be based upon the patient’s availability and the center’s availability for treatment . Our clinical staff is excited to work with you and look forward to following a collaborative approach to treatment! The Manhattan Center For Headache & Neurology IS NOW OPEN ON SATURDAYS! We will see patients on Saturdays from 9:00am – 6:00pm. The center will see patients for consultations, follow ups, EEG testing, IV Infusions, nerve blocks, spg, and patients that are in acute pain are encouraged to schedule an appointment. We look forward to seeing you on Saturdays! The Manhattan Center for Headache and Neurology is also offering an exciting opportunity for patients to become part of our new Headache Membership: The Purple Membership! Membership includes newsletters, bimonthly support groups, educational lectures, biofeedback packages, massage packages, reiki packages, botox for TMJ, and much more! We welcome you to call (646) 559-4659 or click here for more information. Our first headache meeting was a success and we will continue to offer headache group meetings to our patients at The Manhattan Center For Headache & Neurology. Finger foods and refreshments will be served. We look forward to see you there! Bring a friend! Dr. Halpern encourages you to review the bios of her clinical staff. She is extremely proud of them and encourages each patient to schedule an appointment with any of the practitioners for your neurological care. As always, we value and thank you for being a part of The Manhattan Center for Headache & Neurology.